Potatoes and mushrooms are two of the staples of Belarusian cuisine, so it's no surprise that mushroom-stuffed potato pancakes are a local specialty. 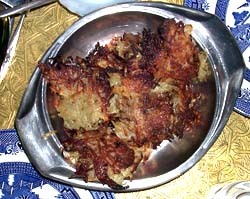 Draniki can also be plained or filled with other ingredients. I was surprised that dried mushrooms were used instead of fresh ones, given how omnipresent mushrooms are in Belarus. I found out, however, that dried mushrooms are supposed to be much more flavorful than frehs ones and therefore are often preferred. This dish was pretty easy to make and surprisingly tasty. The draniki can be a little oily, though, and they did fall apart a bit when I made them. Still, they do reheat well and we ate them all. Prepare the stuffing. Wash the dried mushrooms and soak in cold water for 3-4 hours. Wash the mushrooms again and return to the water you used to soak them. Pour water with mushrooms into a saucepan and boil for about 1 hour. Remove mushrooms from the stock and mince finely. Reserve the stock. Meanwhile, fry the slice onion until golden. Add the minced mushrooms and 1/2 cup of the mushroom stock and mix well. Prepare the draniki. Shred the raw potatoes and wring them out. Add the flour, egg, salt and pepper and mix. Shape the potato mixture into small balls, flatten with your hand, put a little bit of filling on top and cover with more potato mixture. Flatten into patties and fry until golden brown. Place in oven for a few minutes and serve. You can accompany the draniki with sour cream.